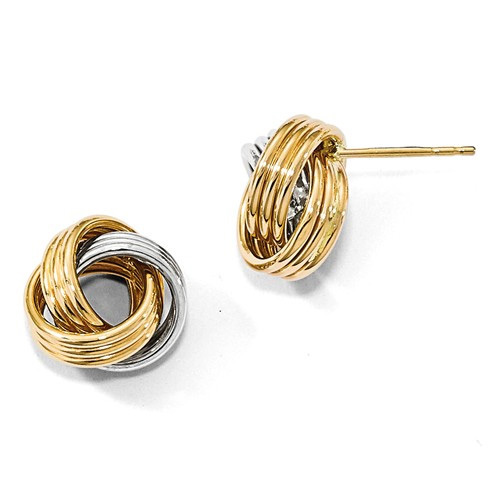 These 14K two-tone gold polished love knot earrings from Apples of Gold Jewelry combine the warm look of yellow gold and the sparkling look of white gold to create a fun and fantastic set of earrings that you will love! The love knot, which is known for representing friendship and love for centuries, is represented in both colors of gold - two of the three knot loops are fashioned in 14K yellow gold, while the third is made from 14K white gold. The earrings feature a highly polished finish, and each one measures 12.5mm by 12.75mm in size. We guarantee our 14K Two-Tone Gold Polished Love Knot Earrings to be high quality, authentic jewelry, as described above.